As the president put it, "promoting science isn't just about providing resources--it is also about protecting free and open inquiry … free from manipulation or coercion, and listening to what [scientists] tell us, even when it's inconvenient--especially when it's inconvenient." In using the words "manipulation" and "coercion," the president was not speaking purely in the abstract; he was alluding to recent breaches of a code to which government must adhere if science is to play its proper role in advising the government on such complex issues as public health, climate change, or environmental protection. When the government systematically disregards this code, it undermines the historic role of science as a bulwark of an enlightened democracy. In the president's Memorandum on Scientific Integrity last week, addressed to the heads of all executive departments and agencies, he directed those officials to neither suppress nor alter scientific and technological findings solicited in the process of policy formulation. He also asked that scientific information developed or used by the government be made readily available to the public. To put these directives in place, the president requested the director of the Office of Science and Technology Policy to develop, within 120 days, recommendations "designed to guarantee scientific integrity throughout the executive branch" and to ensure "that scientific data is never distorted or concealed to serve a political agenda." Brain structures that correlate with impulse control in boys. Emerging data on the neural mechanisms of impulse control highlight brain regions involved in emotion and decision making, including the ventromedial prefrontal cortex (vmPFC), anterior cingulate cortex (ACC) and amygdala. Variation in the development of these regions may influence one's propensity for impulsivity and, by extension, one's vulnerability to disorders involving low impulse control (e.g. substance abuse). Here we test the hypothesis that lower impulse control is associated with structural differences in these regions, particularly on the right side, in 61 normal healthy boys aged 7–17. We assessed parent- and teacher-reported behavioral ratings of impulse control (motor impulsivity and non-planning behavior) in relation to vmPFC, ACC and amygdala volume, measured using structural magnetic resonance imaging and FreeSurfer. A regression analysis showed that the right vmPFC was a significant predictor of impulse control ratings. Follow-up tests showed (i) a significant correlation between low impulse control and decreased right vmPFC volume, especially the medial sector of the vmPFC and (ii) significantly lower right vmPFC volume in a subgroup of 20 impulsive boys relative to 20 non-impulsive boys. These results are consistent with the notion that right vmPFC provides a neuroanatomical correlate of the normal variance in impulse control observed in boys. I found this video about the growth of information interesting and overwhelming...you will want to turn down the volume a bit. Again, a tip of the hat to my son Jon for finding it. I generally don't delve into cellular and molecular stuff in this blog (even though my previous lab research was at this level), but sometimes a trick comes along that is so neat that I want to mention it. Alilain et al. manage to restore breathing in rodents with acute spinal cord injury by infecting neurons that constitute the phrenic motor nucleus with a sindbis virus that expresses an algal light-gated ion channel that activates nerve cells by driving cation influx when illuminated with blue light, and also expresses green fluorescent protein (to visualize the nerve cells that have taken up the virus). The authors were able to both visualize and photostimulate the target cells that directly innervate the diaphragm muscles. Here is their abstract, following by a summary graphic from the review by Arenkiel and Peca. Paralysis is a major consequence of spinal cord injury (SCI). After cervical SCI, respiratory deficits can result through interruption of descending presynaptic inputs to respiratory motor neurons in the spinal cord. Expression of channelrhodopsin-2 (ChR2) and photostimulation in neurons affects neuronal excitability and produces action potentials without any kind of presynaptic inputs. We hypothesized that after transducing spinal neurons in and around the phrenic motor pool to express ChR2, photostimulation would restore respiratory motor function in cervical SCI adult animals. Here we show that light activation of ChR2-expressing animals was sufficient to bring about recovery of respiratory diaphragmatic motor activity. Furthermore, robust rhythmic activity persisted long after photostimulation had ceased. This recovery was accomplished through a form of respiratory plasticity and spinal adaptation which is NMDA receptor dependent. These data suggest a novel, minimally invasive therapeutic avenue to exercise denervated circuitry and/or restore motor function after SCI. Figure: (click to enlarge) Phrenic motor neurons in the respiratory circuit show light-induced plasticity. A: anatomical diagram of the respiratory circuit. Dashed blue and red lines represent known ipsilateral and contralateral connections between the ventral respiratory group neurons, whereas the solid gray line represents potential cross talk between the phrenic motor neurons. Lesion region is highlighted in addition to the neurons targeted for Channelrhodopsin-2 (ChR2) expression (green circles). B: cellular model of how light-gated ion influx leads to classic potentiation. Photostimulation of ChR2 drives rapid cation influx, which in turn removes N-methyl-D-aspartate receptor (NMDAR) block and allows sparse glutamate signaling to activate NMDARs. NMDAR activation might then mediate classic potentiation mechanisms by promoting AMPA receptor insertion. As a followup to my Jan 16 posting on this topic, I pass on a 'letters to the editor' exchange. The article by Coates et al. adds interesting evidence that a low 2D:4D ratio in men predicts success, not only in sports or music, but also in job performance. According to the authors, low-2D:4D traders perform better (i.e., they earn more) because of basic characteristics: rapid visuomotor scanning and physical reflexes. However, they overlook another frugal explanation for their findings. Recently, it has been shown that low-2D:4D men react much more strongly on performance feedback than high-2D:4D men, irrespective of the performance itself. When men with a low 2D:4D ratio find themselves in a subordinate status position (e.g., when they lose a game), they might react strongly, e.g., by acting impulsively, or perhaps even abandoning the activity if possible. Following this rationale, my hypothesis is that low-2D:4D men want to excel and therefore will look for a specific domain (in both hobbies and jobs) where they have the abilities to excel. This idea might help to explain why a low 2D:4D ratio in men is related to better performance in completely different domains such as sports and music.The same mechanism might also lead to a better performance in trading in the financial world but needs not be limited to this type of job. I expect low-2D:4D people to outperform high-2D:4D people in all kind of competitive jobs, sports, and other activities, not because of specific physical characteristics, but because of one specific psychological characteristic: a higher need for achievement. Kobe Millet, in a letter commenting on the correlations we found between digit ratios and success in high-frequency trading, suggests that digit ratios gauge the psychological need to excel rather than a physiological characteristic. However, if this were true, then we would find low 2D:4D among successful people of most occupations, but I do not believe we do. One study, for example, found that faculty in the math and science departments of universities had higher more-feminine digit ratios. Furthermore, several digit-ratio studies have controlled for effort and found that relative performance in many sports is predicted by 2D:4D independently of training intensity. Lastly, our own findings show that a lower 2D:4D predicts greater trading profit and loss when the volatility of the market increases, higher volatility demanding faster reaction times. This result, together with the sporting studies mentioned above, suggests that a physiological trait rather than a psychological one is at least partly responsible for success in these fields. We should, however, point out that our study could not fully test for the mechanism underlying the correlations between trading success and digit ratio. Only laboratory work can establish this mechanism. Our study rather was a piece of field work, a type of study we feel is sadly lacking in the new subject of neuroscience and economics. In field work, you forgo the ability to establish mechanism, but what you lose in rigor you pick up in relevance. We are all wired differently - first analysis of a mammalian "connectome"
A complete wiring diagram—where axons go, how they branch, and where they link to muscle—has been developed for roundworms, but never before for a mammal. Performing the same feat in the mouse has presented an enormous technical challenge because of the larger size and complexity of the nervous system. The authors chose to study the interscutularis muscle, which connects the base of the ear to the middle of the skull, because it was small, accessible, and innervated by relatively few neurons...Using mice whose cells all bore a fluorescent tag, and a confocal microscope with a computer-controlled, motorized stage, the authors took thousands of individual photographs and reconstructed them to trace individual axons as they stretched across the skull, entered the muscle, branched repeatedly, and ultimately formed synapses with individual muscle fibers. In the worm, the routes taken and connections made by axons are highly stereotyped, indicating a high degree of genetic control. But in the mouse, the actual number of axons innervating a single muscle ranged from 13 to 16, differing between mice and even between the left and right sides of the same mouse. 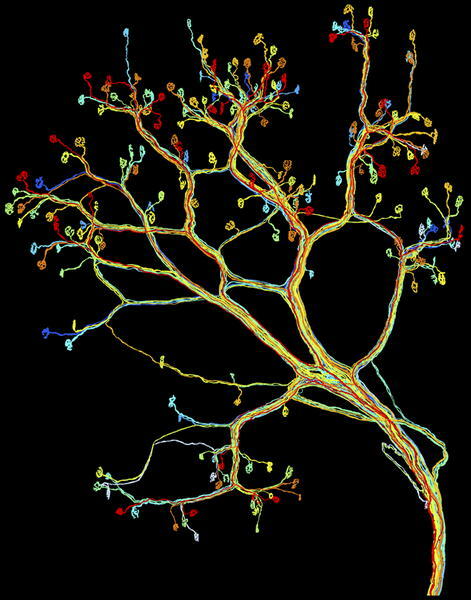 Axonal length, including all the branches, varied much more widely, from 1.5 millimeters to 13.3 millimeters, and the number of synapses formed by a single axon ranged from a low of one (for an axon that didn't branch at all) to a high of 37. The branching pattern of axons that innervate a similar number of muscle fibers from different muscles also differed significantly, suggesting that unlike in the worm, branching in the mammal is not a deterministic process; instead it is governed by some general developmental rules, while the details of final connection are shaped by contingencies, as excess synapses are pruned. 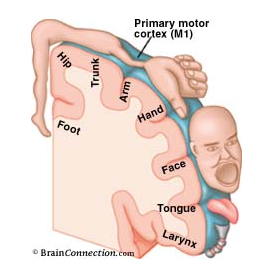 Our motor cortex has a topographic representation of our bodies (a homunculus), as shown in the figure. It has generally been assumed that this organization is "hard wired" by genetic instructions. Stoeckel et al. have now made the fascinating observation that in subjects with congenitally compromised hand function and compensatory skillful foot use, a representation of the foot appears in the vicinity of the normal hand area. Their results imply that during early motor development experience may play a more critical role in the shaping of genetically determined neural networks than previously assumed. Social interactions are influenced by the perception of others as similar or dissimilar to the self. Such judgements could depend on physical and semantic characteristics, such as membership in an ethnic or political group. In the present study we tested whether social representations of the self and of others could affect the perception of touch. To this aim, we assessed tactile perception on the face when subjects observed a face being touched by fingers. In different conditions we manipulated the identity of the shown face. In a first experiment, Caucasian and Maghrebian (Northern African) participants viewed a face belonging either to their own or to a different ethnic group; in a second experiment, Liberal and Conservative politically active participants viewed faces of politicians belonging to their own or to the opposite political party. The results showed that viewing a touched face most strongly enhanced the perception of touch on the observer's face when the observed face belonged to his/her own ethnic or political group. Who you are depends on how you feel. ...as country and individual levels of globalization increase, so too does individual cooperation at the global level vis-à-vis the local level. In essence, “globalized” individuals draw broader group boundaries than others, eschewing parochial motivations in favor of cosmopolitan ones. Globalization may thus be fundamental in shaping contemporary large-scale cooperation and may be a positive force toward the provision of global public goods. A participant (Individual I) may allot the money to his or her Personal account and/or allot it to his or her Local or World group account. The 3 numbers in brackets [x, y, z] represent the returns to I (x), to another person from I's local group (y), and to a person from a different country (z) from a token allotted to I's Personal, Local, or World account, respectively. That is, a token allotted to the Personal account (dotted line) gives 1 token to I and nothing to anyone else. A token allotted to the Local account (dashed line) yields half a token to all of the 3 members of I's Local account but nothing to the people from the other two Local groups. A token allotted to I's World account (solid line) yields a quarter of a token to all of the 12 people in the World group. 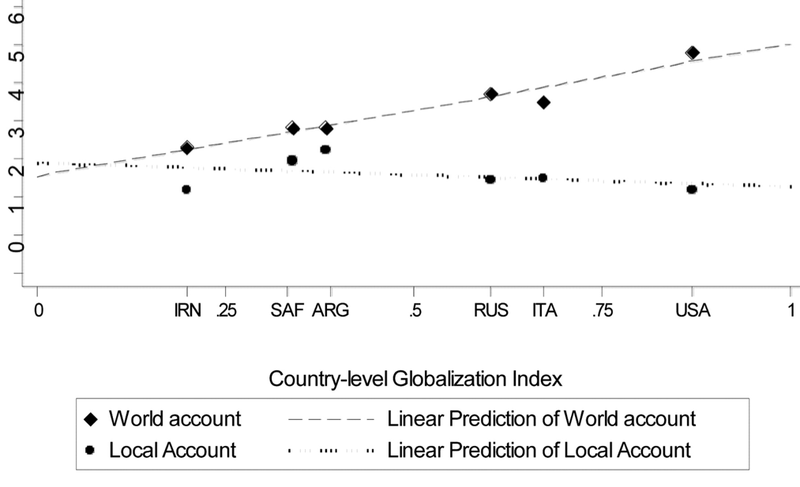 Figure - Relationship between CGI and mean Allocations to World and Local Accounts. Countries are plotted according to their macrolevel globalization score on the x axis and mean aggregate levels of contribution to the World account (diamond points), and Local accounts (square points) on the y axis. The linear predictions for both variables are also plotted. Globalization and the internet diminish cooperation. When we go online, each of us is our own editor, our own gatekeeper. We select the kind of news and opinions that we care most about....Nicholas Negroponte of M.I.T. has called this emerging news product The Daily Me. And if that’s the trend, God save us from ourselves...That’s because there’s pretty good evidence that we generally don’t truly want good information — but rather information that confirms our prejudices. We may believe intellectually in the clash of opinions, but in practice we like to embed ourselves in the reassuring womb of an echo chamber. One of last year’s more fascinating books was Bill Bishop’s “The Big Sort: Why the Clustering of Like-Minded America is Tearing Us Apart.” He argues that Americans increasingly are segregating themselves into communities, clubs and churches where they are surrounded by people who think the way they do...The nation grows more politically segregated — and the benefit that ought to come with having a variety of opinions is lost to the righteousness that is the special entitlement of homogeneous groups...The result is polarization and intolerance. Why jokes are hard to remember. The ease with which people forget jokes is one of those quirks...that ends up revealing a surprising amount about the underlying architecture of memory....We have our version of a buffer...a short-term working memory of limited scope and fast turnover rate...our equivalent of a save button: the hippocampus, deep in the forebrain is essential for translating short-term memories into a more permanent form...what really distinguishes the lasting from the transient is how strongly the memory is engraved in the brain...The deeper the memory, the more readily and robustly an ensemble of like-minded neurons will fire...A simple melody with a simple rhythm and repetition can be a tremendous mnemonic device...It would be a virtually impossible task for young children to memorize a sequence of 26 separate letters if you just gave it to them as a string of information, but when the alphabet is set to the tune of the ABC song with its four melodic phrases, preschoolers can learn it with ease. Really great jokes, on the other hand, punch the lights out of do re mi. They work not by conforming to pattern recognition routines but by subverting them...Jokes work because they deal with the unexpected, starting in one direction and then veering off into another...What makes a joke successful are the same properties that can make it difficult to remember. As frustrating as it can be to forget something new, it’s worse to forget what you already know... Behind the tying up of tongues are the too-delicate nerves of our brain’s frontal lobes and their sensitivity to anxiety and the hormones of fight or flight. The frontal lobes that rifle through stored memories and perform other higher cognitive tasks tend to shut down when the lower brain senses danger and demands that energy be shunted its way....For that reason anxiety can be a test taker’s worst foe. Pride: Adaptive Social Emotion or Seventh Sin? This experiment examined the ability of pride to serve as an adaptive emotion within the context of social interaction. After an in vivo induction of pride or a neutral state, participants engaged in a group problem-solving task. In contrast to a conventional view that pride is often associated with negative interpersonal outcomes, results confirmed that proud individuals not only took on a dominant role within the group problem-solving task, but also were perceived as the most likeable interaction partners. These findings suggest that pride, when representing an appropriate response to actual performance (as opposed to overgeneralized hubris), constitutes a functional social emotion with important implications for leadership and the building of social capital. Musical training enhances detection of emotional components of speech. As a followup to my Feb. 25 post, I pass on work by Kraus and collaborators at Northwestern Univ. in which they tested 30 young adults in three categories: those with no musical training, those who started learning to play a musical instrument before age 7, and those who started later but had at least 10 years of training. The scientists hooked them up to electrodes that recorded the response of the auditory brainstem to a quarter-second of an emotion-laden sound: an infant's wail (see the figure below). The subjects with the most musical experience responded the fastest to the sound. with those who had practiced since early childhood having the strongest response to the parts of the cry for which timing, pitch, and timbre were most complex. Non-musicians did not pick up on fine-grained information in the signal. Musicians exhibit enhanced perception of emotion in speech, although the biological foundations for this advantage remain unconfirmed. In order to gain a better understanding for the influences of musical experience on neural processing of emotionally salient sounds, we recorded brainstem potentials to affective human vocal sounds. Musicians showed enhanced time-domain response magnitude to the most spectrally complex portion of the stimulus and decreased magnitude to the more periodic, less complex portion. Enhanced phase-locking to stimulus periodicity was likewise seen in musicians' responses to the complex portion. These results suggest that auditory expertise engenders both enhancement and efficiency of subcortical neural responses that are intricately connected with acoustic features important for the communication of emotional states. Our findings provide the first biological evidence for behavioral observations indicating that musical training enhances the perception of vocally expressed emotion in addition to establishing a subcortical role in the auditory processing of emotional cues. Fig. 1. Stimulus and grand average response waveforms. Response waveforms have been shifted back in time (∼7 msec) to align the stimulus and response onsets. Boxes delineate two stimulus subsections and the corresponding brainstem responses. The first subsection (112–142 ms) corresponds to the periodic portion and the second (145–212 ms) corresponds to the more complex portion. (A) Stimulus time-amplitude waveform. (B) Stimulus spectrogram. The stimulus F0 is superimposed as a highlighted line (∼280 Hz, left axis) with higher frequency spectral components plotted between white dotted lines (right axis). 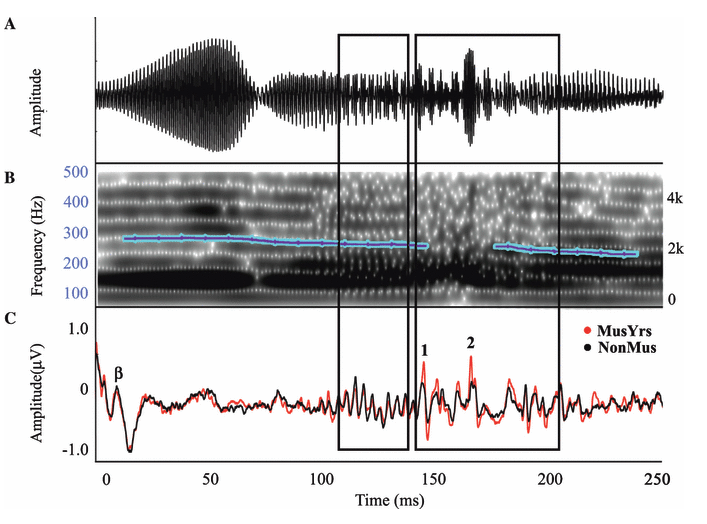 Although the F0 is detectable during the first section, the greater acoustic complexity of the second section results in the inability of the sound analyzing software (Praat) to track the F0. The harmonics are likewise more aperiodic. (C) The averaged responses of MusYrs and NonMus. Major peaks (β, 1 and 2) are labeled above the waveform. A model for the outbreak of cooperation. According to Thomas Hobbes' Leviathan [1651; 2008 (Touchstone, New York), English Ed], “the life of man [is] solitary, poor, nasty, brutish, and short,” and it would need powerful social institutions to establish social order. In reality, however, social cooperation can also arise spontaneously, based on local interactions rather than centralized control. The self-organization of cooperative behavior is particularly puzzling for social dilemmas related to sharing natural resources or creating common goods. Such situations are often described by the prisoner's dilemma. Here, we report the sudden outbreak of predominant cooperation in a noisy world dominated by selfishness and defection, when individuals imitate superior strategies and show success-driven migration. In our model, individuals are unrelated, and do not inherit behavioral traits. They defect or cooperate selfishly when the opportunity arises, and they do not know how often they will interact or have interacted with someone else. Moreover, our individuals have no reputation mechanism to form friendship networks, nor do they have the option of voluntary interaction or costly punishment. Therefore, the outbreak of prevailing cooperation, when directed motion is integrated in a game-theoretical model, is remarkable, particularly when random strategy mutations and random relocations challenge the formation and survival of cooperative clusters. Our results suggest that mobility is significant for the evolution of social order, and essential for its stabilization and maintenance. Empathy modulated by genetic background. In mice, to be sure, but if this is like so many other genetics/behavior studies in mice, the same observations will probably soon be made in humans. Empathy, as originally defined, refers to an emotional experience that is shared among individuals. When discomfort or alarm is detected in another, a variety of behavioral responses can follow, including greater levels of nurturing, consolation or increased vigilance towards a threat. Moreover, changes in systemic physiology often accompany the recognition of distressed states in others. Employing a mouse model of cue-conditioned fear, we asked whether exposure to conspecific distress influences how a mouse subsequently responds to environmental cues that predict this distress. We found that mice are responsive to environmental cues that predict social distress, that their heart rate changes when distress vocalizations are emitted from conspecifics, and that genetic background substantially influences the magnitude of these responses. Specifically, during a series of pre-exposure sessions, repeated experiences of object mice that were exposed to a tone-shock (CS-UCS) contingency resulted in heart rate deceleration in subjects from the gregarious C57BL/6J (B6) strain, but not in subjects from the less social BALB/cJ (BALB) strain. Following the pre-exposure sessions, subjects were individually presented with the CS-only for 5 consecutive trials followed by 5 consecutive pairings of the CS with the UCS. Pre-exposure to object distress increased the freezing responses of B6 mice, but not BALB mice, on both the CS-only and the CS-UCS trials. These physiological and behavioral responses of B6 mice to social distress parallel features of human empathy. Our paradigm thus has construct and face validity with contemporary views of empathy, and provides unequivocal evidence for a genetic contribution to the expression of empathic behavior. The capacity to appreciate beauty is one of our species' most remarkable traits. Although knowledge about its neural correlates is growing, little is known about any gender-related differences. We have explored possible differences between men and women's neural correlates of aesthetic preference. We have used magnetoencephalography to record the brain activity of 10 male and 10 female participants while they decided whether or not they considered examples of artistic and natural visual stimuli to be beautiful. Our results reveal significantly different activity between the sexes in parietal regions when participants judged the stimuli as beautiful. Activity in this region was bilateral in women, whereas it was lateralized to the right hemisphere in men. It is known that the dorsal visual processing stream, which encompasses the superior parietal areas, has been significantly modified throughout human evolution. We posit that the observed gender-related differences are the result of evolutionary processes that occurred after the splitting of the human and chimpanzee lineages. In view of previous results on gender differences with respect to the neural correlates of coordinate and categorical spatial strategies, we infer that the different strategies used by men and women in assessing aesthetic preference may reflect differences in the strategies associated with the division of labor between our male and female hunter-gatherer hominin ancestors. ...One possible explanation for the greater lateralization in men than in women could be grounded on differences between exploration strategies. Women would carry out an exploration of categorical spatial relations. The processes occurring in the right hemisphere of male participants suggest an exploration strategy based on coordinate spatial relations. ...there are other alternatives to the interpretation based on spatial exploration strategies. It is generally accepted that the right parietal cortex is associated with global visual attention and the left with local attention. Perhaps women make use of both global and local features in making their judgments, whereas men only rely on global features. ...Another hypothesis could link the observations to language. Women obtain higher scores on a diversity of verbal and language tasks. Perhaps women are more likely to associate the images with verbal labels than men, producing the lateralizing differences in neural activity. ...hunter-gatherer hypothesis of gender differences in spatial abilities provides the most convincing scenario. Differences in spatial ability between men and women would be associated with the division of labor between the sexes in hunting and gathering. How to lower your self control. An interesting piece of work from Ackerman et al. We know that imagining or actively perceiving other people's actions can elicit many of the same neural and embodied responses that would occur if we performed those actions ourselves. This work shows that observing someone exerting self control sufficiently engages our empathetic mirroring of that process that it fatigues our own self control! Acts of self-control may deplete an individual's self-regulatory resources. But what are the consequences of perceiving other people's use of self-control? Mentally simulating the actions of others has been found to elicit psychological effects consistent with the actual performance of those actions. Here, we consider how simulating versus merely perceiving the use of willpower can affect self-control abilities. In a first study, participants who simulated the perspective of a person exercising self-control exhibited less restraint over spending on consumer products than did other participants. In a second study, participants who took the perspective of a person using self-control exerted less willpower on an unrelated lexical generation task than did participants who took the perspective of a person who did not use self-control. Conversely, participants who merely read about another person's self-control exerted more willpower than did those who read about actions not requiring self-control. These findings suggest that the actions of other people may either deplete or boost one's own self-control, depending on whether one mentally simulates those actions or merely perceives them. Gay scientists isolate christian gene. My thanks to Mark Weber for bringing this satire to my attention. How does gesturing help children learn? Gesturing might encourage children to extract meaning implicit in their hand movements. If so, children should be sensitive to the particular movements they produce and learn accordingly. Alternatively, all that may matter is that children move their hands. If so, they should learn regardless of which movements they produce. To investigate these alternatives, we manipulated gesturing during a math lesson. We found that children required to produce correct gestures learned more than children required to produce partially correct gestures, who learned more than children required to produce no gestures. This effect was mediated by whether children took information conveyed solely in their gestures and added it to their speech. The findings suggest that body movements are involved not only in processing old ideas, but also in creating new ones. We may be able to lay foundations for new knowledge simply by telling learners how to move their hands. The modern addiction rehabilitation industry...even today is dominated by Wilson's Alcoholics Anonymous (AA) paradigm and its 'twelve-step' approach to recovery. Perhaps unsurprisingly, given its spiritual origins, this approach has had an uneasy relationship with the evidence-based culture of medical research. Both perceive addiction as a chronic disease; but whereas scientists seek rationally targeted interventions to blunt drug cravings, AA and related programmes tend to feature group therapy, tearful confessions and the call to "surrender to a higher power"...In the past few years, however, these two cultures have been finding common ground. Neuroscientists have begun to recognize that some of the most important brain systems impaired in addiction are those in the prefrontal cortex that regulate social cognition, self-monitoring, moral behaviour and other processes that the AA-type approach seems to target....treatment programmes are targeting these systems without necessarily knowing that they are doing it. Religion has been shown to have a strong inverse association with drug addiction...Michael McCullough, who studies religion and behaviour at the University of Miami in Florida, suggests that when a person commits to any cultural system that regulates behaviour, the psychological effort to conform strengthens the brain systems that mediate self-monitoring and self-control. "What makes religion unique, I think, is that the code of conduct isn't just laid down by your parents or your friends or your principal at school, but ostensibly by the individual who is superintending the Universe, so it has an extra moral force." Some religious rituals, he says, have been shown to provoke enhanced activity in prefrontal regions (see Azari et al.). "It's as if certain forms of prayer and meditation are pinpointing precisely those [prefrontal] areas of the brain that people rely on to control attention, to control negative emotion and resolve mental conflict." In pursuing other ways to boost prefrontal systems medicines for ADHD seem an obvious place to start. Attention-enhancing drugs such as methyl-phenidate and atomoxetine boost the activity of key receptor systems in the prefrontal cortex, in particular those for noradrenaline and dopamine. ..The National Institute on Drug Abuse has also been supporting studies of cognitive and behavioural strategies, and Volkow says that she is particularly enthusiastic about an approach that involves "real-time fMRI feedback". Developed by researcher and entrepreneur Christopher deCharms earlier this decade, the technique involves placing drug users in an fMRI machine and showing them a symbolic representation — a flame — of the fMRI-measured brain activity that corresponds to their cravings. The users are then asked to apply their own cognitive exercises, such as imagining their child is with them, to quench their cravings and douse the flame. After half a dozen sessions with this feedback the user will, in principle, develop cognitive circuitry that is more efficient at suppressing craving and that can then be used in ordinary life. A version of the technique, used for pain relief, has already shown some efficacy in a small clinical trial, and deCharms and his Silicon Valley start-up, Omneuron, are currently running a small trial in smokers — with plans for a follow up with some of Childress's cocaine users. Negative attitude towards aging when young: decrease in later cardiovascular health. Levy et al. examine a cohort of 440 individuals drawn from the Baltimore Longitudinal Study of Aging whose attitudes on aging was tested starting in 1968 when they were young (18–49 years, mean age = 36.5 years) and then noted cardiovascular events (89 total, including angina attacks, congestive heart failures, myocardial infarctions, strokes, and transient ischemic attacks) until 2007. 30 years after participants had responded to the age stereotype measure 25% of those with negative-age-stereotypes had experienced a cardiovascular event, compared to 13% who had positive-age-stereotypes. 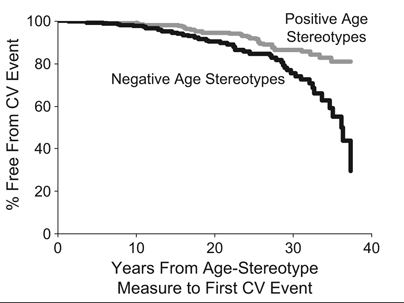 Association between age stereotypes and time until experiencing a first cardiovascular (CV) event. The graph shows the percentage of participants who had not experienced a CV event as a function of time in each age-stereotype group. Mental fatigue impairs our physical performance. This study by Marcora et al. compared subjects who first either watched a movie for 90 min., or did computer exercises requiring concentration, memory and reaction speed - following which all exercised on a stationary bicycle until they were exhausted — that is, unable to maintain a cadence of 60 revolutions per minute. There were no significant differences in physiological measures (heart rate, cardiac output and others) under the two conditions, but bicyclers consistently tired about 15 percent more quickly after the mental exercise than after watching the movies. Apparently their poorer exercise results after mental effort were not caused by reduced performance of their bodies, but because mental fatigue limits exercise tolerance through higher perception of effort. The Ricky Gervais Show on the "I-Illusion"
Thanks to my son Jon for pointing me to this humorous video. I'm realizing that I have a sufficient number of notes from this area in my queue that I'm not going to get to them separately. So, here I pass on first some links to recent publications and then some work on neural correlates of religious belief. "How God changes your brain"
"Contemplative Science: Where Buddhism and Neuroscience Converge"
We propose an integrative cognitive neuroscience framework for understanding the cognitive and neural foundations of religious belief. Our analysis reveals 3 principle psychological dimensions of religious belief (God's perceived level of involvement, God's perceived emotion, and doctrinal/experiential religious knowledge), which functional MRI localizes within networks processing Theory of Mind regarding intent and emotion, abstract semantics, and imagery. Our results are unique in demonstrating that specific components of religious belief are mediated by well-known brain networks, and support contemporary psychological theories that ground religious belief within evolutionary adaptive cognitive functions. Many people derive peace of mind and purpose in life from their belief in God. For others, however, religion provides unsatisfying answers. Are there brain differences between believers and nonbelievers? Here we show that religious conviction is marked by reduced reactivity in the anterior cingulate cortex (ACC), a cortical system that is involved in the experience of anxiety and is important for self-regulation. In two studies, we recorded electroencephalographic neural reactivity in the ACC as participants completed a Stroop task. Results showed that stronger religious zeal and greater belief in God were associated with less firing of the ACC in response to error and with commission of fewer errors. These correlations remained strong even after we controlled for personality and cognitive ability. These results suggest that religious conviction provides a framework for understanding and acting within one's environment, thereby acting as a buffer against anxiety and minimizing the experience of error. Two studies tested the hypothesis that exposure to violent media reduces aid offered to people in pain. In the first study, participants played a violent or nonviolent video game for 20 min. After game play, while completing a lengthy questionnaire, they heard a loud fight, in which one person was injured, outside the lab. Participants who played violent games took longer to help the injured victim, rated the fight as less serious, and were less likely to "hear" the fight in comparison to participants who played nonviolent games. In the second study, violent- and nonviolent-movie attendees witnessed a young woman with an injured ankle struggle to pick up her crutches outside the theater either before or after the movie. Participants who had just watched a violent movie took longer to help than participants in the other three conditions. The findings from both studies suggest that violent media make people numb to the pain and suffering of others. The point of James Surowiecki's engaging book, "The Wisdom of Crowds" is that a marketplace - of ideas, goods, services, whatever - can make astonishingly accurate predictions of election outcomes, Oscar winners, etc. Herzog and Hertwig ask how a single individual might improve a best guess for an outcome and test a Hegelian process they call "dialectical bootstrapping." After making the first estimate, consider the reasons and assumptions underpinning that estimate (and how they might be off target), and then formulate a new, second estimate that harks back to somewhat different knowledge. They tested the efficacy of this method by asking 101 students at the University of Basel to date a collection of 40 historical events (e.g., the discovery of electricity), 10 each from the 16th, 17th, 18th, and 19th centuries. Each participant was randomly assigned to one of two conditions. In both conditions, participants first generated their estimates without knowing that they would be asked later to generate a second estimate. In the dialectical-bootstrapping condition, participants (n= 50) were then asked to give dialectical estimates (while their first estimates were displayed in front of them) using a technique inspired by the consider-the-opposite strategy: First, assume that your first estimate is off the mark. Second, think about a few reasons why that could be. Which assumptions and considerations could have been wrong? Third, what do these new considerations imply? Was the first estimate rather too high or too low? Fourth, based on this new perspective, make a second, alternative estimate. They found that the improvement in accuracy (in years) over the first estimate was twice as large for the dialectical average than for the repeat average, although averaging the first estimates from two random individuals worked better still. ...the extraordinary social skills of an infant are at the heart of what makes us human. Through its ability to solicit and secure the attentive care not just of its mother but of many others in its sensory purview, a baby promotes many of the behaviors and emotions that we prize in ourselves and that often distinguish us from other animals, including a willingness to share, to cooperate with strangers, to relax one’s guard...Our capacity to cooperate in groups, to empathize with others and to wonder what others are thinking and feeling...probably arose in response to the selective pressures of being in a cooperatively breeding social group, and the need to trust and rely on others and be deemed trustworthy and reliable in turn. Babies became adorable and keen to make connections with every passing adult gaze....mother chimpanzees and gorillas jealously hold on to their infants for the first six months or more of life. Other females may express real interest in the newborn, but the mother does not let go: you never know when one of those females will turn infanticidal, or be unwilling or unable to defend the young ape against an infanticidal male. Dr. Hrdy also argues that our human ancestors became emotionally modern long before the human brain had reached its current average volume of 1,300 cubic centimeters, which is about three times the size of a chimpanzee brain — in other words, that we became the nicest apes before becoming the smartest. You don’t need a bulging brain to evolve cooperative breeding. Many species of birds breed cooperatively, as do lions, rats, meerkats, wolves and marmosets, among others. 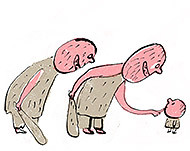 But to become a cooperatively breeding ape, and to persuade a bunch of smart, hot-tempered, suspicious, politically cunning primates to start sharing child care and provisionings, now that took a novel evolutionary development, the advent of this thing called trust. Talk of linguistic universals has given cognitive scientists the impression that languages are all built to a common pattern. In fact, there are vanishingly few universals of language in the direct sense that all languages exhibit them. Instead, diversity can be found at almost every level of linguistic organization. This fundamentally changes the object of enquiry from a cognitive science perspective. The article summarizes decades of cross-linguistic work by typologists and descriptive linguists, showing just how few and unprofound the universal characteristics of language are, once we honestly confront the diversity offered to us by the world's 6-8000 languages. After surveying the various uses of 'universal', we illustrate the ways languages vary radically in sound, meaning, and syntactic organization, then examine in more detail the core grammatical machinery of recursion, constituency, and grammatical relations. While there are significant recurrent patterns in organization, these are better explained as stable engineering solutions satisfying multiple design constraints,reflecting both cultural-historical factors and the constraints of human cognition. Linguistic diversity then becomes the crucial datum for cognitive science: we are the only species with a communication system which is fundamentally variable at all levels. 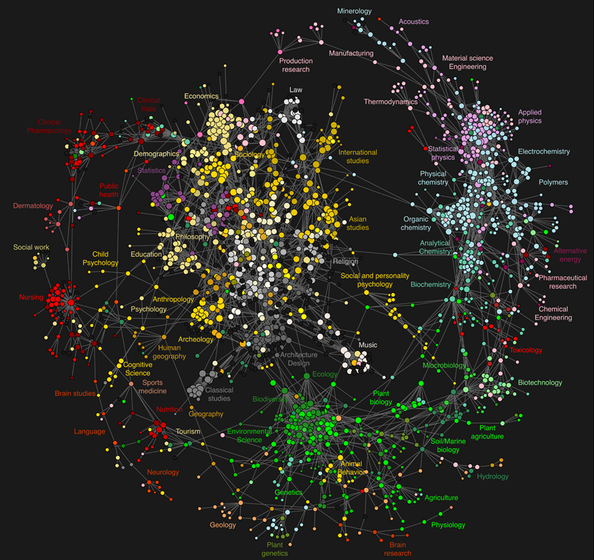 Recognising the true extent of structural diversity in human language opens up exciting new research directions for cognitive scientists, offering thousands of different natural experiments given by different languages, with new opportunities for dialogue with biological paradigms concerned with change and diversity, and confronting us with the extraordinary plasticity of the highest human skills. 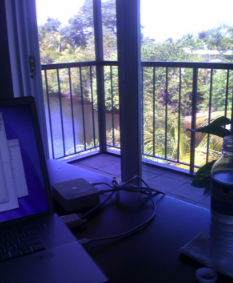 Inspired by 'the view from your window' feature of Andrew Sullivan's Blog, I thought I would post an iPhone photo of where I am sitting (in Fort Lauderdale, Florida) as I bang out MindBlog's posts. I will be heading back to Madison Wisconsin in early April. Subjects perceived the step to be higher in the V (vertical stripes on the height dimension) configuration on the right compared to the H (horizontal stripes) configuration on the left, and correspondingly raised their toes higher to clear the step. Science and religion have had a long relationship, by turns collegial and adversarial. In the 17th century Galileo ran afoul of the Church's geocentrism, and in the 19th century Darwin challenged the biblical account of creation. The breaches that open at such times often close again, as religions determine that the doctrine in question is not an essential part of faith. This is precisely what happened with geocentrism and, outside of certain American fundamentalist Christian sects, evolution. A new challenge to the science-religion relationship is currently at hand. We hope that, with careful consideration by scientists and theologians, it will not become the latest front in what some have called the "culture war" between science and religion. The challenge comes from neuroscience and concerns our understanding of human nature. Most religions endorse the idea of a soul (or spirit) that is distinct from the physical body. Yet as neuroscience advances, it increasingly seems that all aspects of a person can be explained by the functioning of a material system. This first became clear in the realms of motor control and perception. Yet, models of perceptual and motor capacities such as color vision and gait do not directly threaten the idea of the soul. You can still believe in what Gilbert Ryle called "the ghost in the machine" and simply conclude that color vision and gait are features of the machine rather than the ghost. However, as neuroscience begins to reveal the mechanisms underlying personality, love, morality, and spirituality, the idea of a ghost in the machine becomes strained. Brain imaging indicates that all of these traits have physical correlates in brain function. Furthermore, pharmacologic influences on these traits, as well as the effects of localized stimulation or damage, demonstrate that the brain processes in question are not mere correlates but are the physical bases of these central aspects of our personhood. If these aspects of the person are all features of the machine, why have a ghost at all? By raising questions like this, it seems likely that neuroscience will pose a far more fundamental challenge than evolutionary biology to many religions. Predictably, then, some theologians and even neuroscientists are resisting the implications of modern cognitive and affective neuroscience. "Nonmaterialist neuroscience" has joined "intelligent design" as an alternative interpretation of scientific data. This work is counterproductive, however, in that it ignores what most scholars of the Hebrew and Christian scriptures now understand about biblical views of human nature. These views were physicalist, and body-soul dualism entered Christian thought around a century after Jesus' day. To be sure, dualism is intuitively compelling. Yet science often requires us to reject otherwise plausible beliefs in the face of evidence to the contrary. A full understanding of why Earth orbits the Sun (as a consequence of the way the solar system was formed) took another century after Galileo's time to develop. It may take even longer to understand why certain material systems give rise to consciousness. In the meantime, just as Galileo's view of Earth in the heavens did not render our world any less precious or beautiful, neither does the physicalism of neuroscience detract from the value or meaning of human life. In any new context, we first have to remember that the goal of an economy is to sustainably improve human well-being and quality of life. Material consumption and GDP are merely means to that end, not ends in themselves. We have to recognize, as both ancient wisdom and new psychological research tell us, that material consumption beyond real need can actually reduce overall well-being. Ensure the Well-Being of Populations During the Transition. We must ensure that reductions in economic output and consumption fall on those with the lowest marginal utility of consumption, the wealthy. Presently, the U.S. tax code taxes the third wealthiest man in the world, Warren Buffett, at 17.7%, while his receptionist is taxed at the average rate of 30%....although qualitative development may continue indefinitely... existing levels of physical economic output and consumption are already unsustainable and should be reduced. Reduce Complexity and Increase Resilience. Efforts to create new cultural/institutional variants can benefit from the lessons offered by history, particularly cases of successful adaptation...Although environmental factors contribute to decline, equally important are the decisions made during the crises. A society's responses depend on the ability of its political, economic, and social institutions to respond, as well as on its cultural values. Recognizing that we are in a biophysical crisis because of our over-consumption and lack of protection of ecosystem services, we must invest in institutions and the technologies required to reduce the impact of the market economy and to preserve and protect public goods. It is now time to create another major category of institution, the commons sector, which would be responsible for managing existing common assets and for creating new ones. Some assets should be held in common because it is more just; these include resources created by nature or by society as a whole. Remove Barriers to Improving Knowledge and Technology. With the invention of television, political advertisements became a critical outlet for candidates to broadcast their message and to sway voters. However, the decentralized nature of the Internet allows citizens to gain knowledge about what is done in their name, just as politicians can find out more about those they claim to represent. As a means of two-way communication, the Internet provides voters the ability to speak out within their government without leaving their homes. For the Internet to transform the idea of electronic democracy, universal access is critical. Currently technological, financial, and social barriers exist to such universal accessibility. Removal of these barriers thus becomes a major goal for replacement of the current plutocracy with real democracy. Persistent effect of early abuse or deprivation on immune function in humans. The wisconsin group that has studied various aspect of early abuse and deprivation in children offers evidence that adult immune function is compromised in these children, even if they were adopted into nuturing families and more benevolent settings. It is well known that children need solicitous parenting and a nurturing rearing environment to ensure their normal behavioral development. Early adversity often negatively impacts emotional and mental well-being, but it is less clearly established how much the maturation and regulation of physiological systems is also compromised. The following research investigated the effect of 2 different types of adverse childhood experiences, early deprivation through institutionalization and physical abuse, on a previously unexplored outcome: the containment of herpes simplex virus (HSV). The presence of HSV-specific antibody in salivary specimens was determined in 155 adolescents, including 41 postinstitutionalized, 34 physically-abused, and 80 demographically-similar control youth. Across 4 school and home days, HSV antibody was higher in both postinstitutionalized and physically-abused adolescents when compared with control participants. Because the prevalence of HSV infection was similar across the groups, the elevated antibody was likely indicative of viral recrudescence from latency. Total secretory Ig-A secretion was associated with HSV, but did not account for the group differences in HSV-specific antibody. These findings are likely caused by a failure of cellular immune processes to limit viral reactivation, indicating a persistent effect of early rearing on immune functioning. The fact that antibody profiles were still altered years after adoption into a more benevolent setting with supportive families suggests these results were not caused by contemporaneous factors, but rather reflect a lingering influence of earlier life experiences. An interesting synthesis from Chapman et al. In common parlance, moral transgressions "leave a bad taste in the mouth." This metaphor implies a link between moral disgust and more primitive forms of disgust related to toxicity and disease, yet convincing evidence for this relationship is still lacking. We tested directly the primitive oral origins of moral disgust by searching for similarity in the facial motor activity evoked by gustatory distaste (elicited by unpleasant tastes), basic disgust (elicited by photographs of contaminants), and moral disgust (elicited by unfair treatment in an economic game). We found that all three states evoked activation of the levator labii muscle region of the face, characteristic of an oralnasal rejection response. These results suggest that immorality elicits the same disgust as disease vectors and bad tastes. Domains of disgust. The schematic represents routes by which eliciting situations may trigger the disgust output program. Those that run through the disgust evaluation system--which includes appraisal of the elicitor, feelings, and contamination ideation--trigger the full disgust emotion. Solid lines represent routes through which an elicitor can activate the disgust evaluation-output program. Dashed lines (green) represent direct elicitation of the disgust output program. The dotted line (brown) represents a metaphoric, indirect route. According to the principle of preadaptation, a system that evolves for one purpose is later used for another purpose. From this viewpoint, disgust originates in the mammalian bitter taste rejection system, which directly activates a disgust output system. This primal route (e.g., bitter and some other tastes) evokes only the output program, without a disgust evaluation phase. During human evolution, the disgust output system was harnessed to a disgust evaluation system that responded not to simple sensory inputs (such as bitter tastes) but to more cognitively elaborated appraisals (e.g., a cockroach). Initially, the evaluation system was a food rejection system that rejected potential foods on the basis of their nature or perceived origin. This was the first "true disgust," because it engaged this evaluation system. Later, through some combination of biological and cultural evolution, the eliciting category was enlarged to include reminders of our animal nature, as wel as some people or social groups. This process had adaptive value, because by making things or thoughts disgusting a culture could communicate their negativity and cause withdrawal from them. Brain activity started by music you think you are going to hear. Music consists of sound sequences that require integration over time. As we become familiar with music, associations between notes, melodies, and entire symphonic movements become stronger and more complex. These associations can become so tight that, for example, hearing the end of one album track can elicit a robust image of the upcoming track while anticipating it in total silence. Here, we study this predictive "anticipatory imagery" at various stages throughout learning and investigate activity changes in corresponding neural structures using functional magnetic resonance imaging. Anticipatory imagery (in silence) for highly familiar naturalistic music was accompanied by pronounced activity in rostral prefrontal cortex (PFC) and premotor areas. Examining changes in the neural bases of anticipatory imagery during two stages of learning conditional associations between simple melodies, however, demonstrates the importance of fronto-striatal connections, consistent with a role of the basal ganglia in "training" frontal cortex. Another striking change in neural resources during learning was a shift between caudal PFC earlier to rostral PFC later in learning. Our findings regarding musical anticipation and sound sequence learning are highly compatible with studies of motor sequence learning, suggesting common predictive mechanisms in both domains. A mother's experience can alter her offspring's memory performance. The idea that qualities acquired from experience can be transmitted to future offspring has long been considered incompatible with current understanding of genetics. However, the recent documentation of non-Mendelian transgenerational inheritance makes such a "Lamarckian"-like phenomenon more plausible. Here, we demonstrate that exposure of 15-d-old mice to 2 weeks of an enriched environment (EE), that includes exposure to novel objects, elevated social interactions and voluntary exercise, enhances long-term potentiation (LTP) not only in these enriched mice but also in their future offspring through early adolescence, even if the offspring never experience EE. In both generations, LTP induction is augmented by a newly appearing cAMP/p38 MAP kinase-dependent signaling cascade. Strikingly, defective LTP and contextual fear conditioning memory normally associated with ras-grf knock-out mice are both masked in the offspring of enriched mutant parents. The transgenerational transmission of this effect occurs from the enriched mother to her offspring during embryogenesis. ...when you can get an array of astounding courses from places like Academic Earth, with the videos of the lectures shown in your web browser. I recommend the introductory Psychology course offered by Paul Bloom at Yale. ...Fowler et al examined the social network characteristics of 1,110 twins from an Adolescent Health Dataset which is based on interviews of high school students. Presuming that the social environment that twins share is not influenced by whether they are monozygotic or dizygotic, if network characteristics are significantly more correlated among monozygotic twins than dizygotic twins then there is evidence for a genetic role in network formation. The network characteristics that Fowler et al.investigate are: in-degree (how many students name a given student as a friend), out-degree (how many students a given student names as friends), transitivity (if A and B are friends, and B and C are friends, what is the likelihood that A and C are friends), and betweenness centrality (the fraction of shortest paths between other pairs of students that a given student lies on). Their statistical analysis assumes that the variation in a network characteristic can be additively separated into a component that is genetic, a component caused by the environment that would be shared with a twin, and a component caused by the environment that would not be shared with a twin. The covariance between monozygotic twins is then the variance caused by the common environment plus the variance caused by genetic factors, whereas the covariance between dizygotic twins is the variance caused by the common environment plus half of the variance caused by genetic factors. This formulation allows one to solve for the percentage of variation in a given network characteristic that is caused by each of the genetic, common environment, and unshared environment components. The figure shows that almost half of the variation in transitivity and in-degree are genetically attributable, and more than a quarter of betweenness centrality is genetically attributable, but the genetic component of the out-degree variation is too small to be statistically significant. The common environment is statistically insignificant in all cases. (click on figure to enlarge it). Fowler et al. tried a number of network models to fit with the data and found the only one which generated a relationship between genetics and transitivity was an “Attract and Introduce” model built on two assumptions. First, some individuals are inherently more attractive than others, whether physically or otherwise, so they receive more friendship nominations. Second, some individuals are inherently more inclined to introduce new friends to existing friends (and hence such individuals will indirectly enhance their own transitivity). Brain correlates of musical improvisation. Berkowitz and Ansari report an fMRI study of the brains of trained pianists while they are improvising. To get control conditions for comparisons they designed a series of four activities. In the two general types of tasks, they had subjects either improvise melodies or play pre-learned patterns. Comparing brain activity in these two situations allowed them to focus on melodic improvisation. Subjects did each of these two general tasks either with or without a metronome. When there was no metronome marking time, subjects improvised their own rhythms. Comparing conditions with and without metronome allowed them to look at rhythmic improvisation. A key point is that when the subjects played patterns (instead of improvised melodies), they could choose to play them in any order. Thus there was still some spontaneity in decision making, but the choices were more limited than during improvisation. Improvising, from a neurobiological perspective, involves generating, selecting, and executing musical-motor sequences, something that wouldn’t surprise musicians. But in terms of brain research, it’s a new piece of information. Erasing fear responses and preventing the return of fear. Animal studies have shown that fear memories can change when recalled, a process referred to as reconsolidation. We found that oral administration of the -adrenergic receptor antagonist propranolol before memory reactivation in humans erased the behavioral expression of the fear memory 24 h later and prevented the return of fear. Disrupting the reconsolidation of fear memory opens up new avenues for providing a long-term cure for patients with emotional disorders. The conditioned fear response was measured as potentiation of the eyeblink startle reflex to a loud noise (40 ms, 104 dB) by electromyography of the right orbicularis oculi muscle. Stronger startle responses to the loud noise during the fear-conditioned stimulus (CS1+) as compared with the control stimulus (CS2-) reflects the fearful state of the participant elicited by CS1+. Startle potentiation taps directly into the amygdala, and fear-conditioning procedures yield highly reliable and robust startle potentiation. Figure. (click to enlarge) (a–f) Mean startle potentiation to the fear-conditioned stimulus (CS1), the control stimulus (CS2) and noise alone (NA) trials (left) and mean expectancy scores of the unconditioned stimulus to CS1 and CS2 trials (right) during acquisition (trial 1–8), extinction (trial 1–10) and test (trial 1–5) for the placebo (n = 20, a,b), propranolol reactivation (n = 20, c,d) and propranolol without reactivation (n = 20, e,f) group. CS1+ refers to the fear conditioned stimulus during acquisition, CS1- refers to the fear conditioned stimulus during extinction and test, CS1-R refers to the reactivation of the fear conditioned stimulus and CS2- refers to the control stimulus during all phases of the experiment. 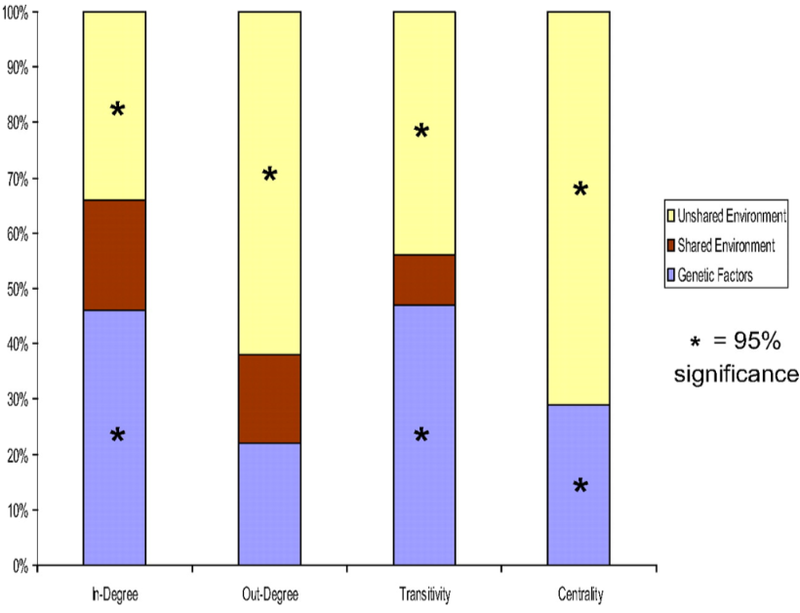 Error bars represent s.e.m. ....the new vision of transcendence coming out of neuroscience. It’s long been observed that intelligent organisms require love to develop or even just to survive. Not coincidentally, we can readily identify brain functions that allow and require us to be deeply relational with others. There are also aspects of the brain that can be shown to equip us to experience elevated moments when we transcend boundaries of self. What happens as the implications of all this research starts suggesting that particular religions are just cultural artifacts built on top of universal human physical traits? Individuals vary in their willingness to take financial risks. Here we show that variants of two genes that regulate dopamine and serotonin neurotransmission and have been previously linked to emotional behavior, anxiety and addiction (5-HTTLPR and DRD4) are significant determinants of risk taking in investment decisions. We find that the 5-HTTLPR s/s allele carriers take 28% less risk than those carrying the s/l or l/l alleles of the gene. DRD4 7-repeat allele carriers take 25% more risk than individuals without the 7-repeat allele. These findings contribute to the emerging literature on the genetic determinants of economic behavior. What did you do on New Year's Eve? I watched my friends eat dog food. Throughout the last night of 2008, I stood in a makeshift laboratory in the corner of a packed Brooklyn house party. I presented people with bowls of paté--labeled A through E--and a pile of crackers. I explained that four of the bowls contained human food, including expensive luxury patés. One was canned dog food that had been pulsed in a food processor, giving it the same consistency as that of paté. My open-minded friends looked thoughtfully into the middle distance as they munched on mouthfuls of each, jotted down their assessment on data sheets, and then drifted back into the party. As the data rolled in, my eyes grew wide with amazement. Nobody was guessing correctly which was the dog food. ...The five samples covered a wide price range: two expensive liver patés (duck and chicken), two cheap imitation patés (puréed liverwurst and Spam), and the ultimate bargain (dog food). My subjects were hopeless at guessing which paté was dog food. But the answer was literally on the tip of their tongues. 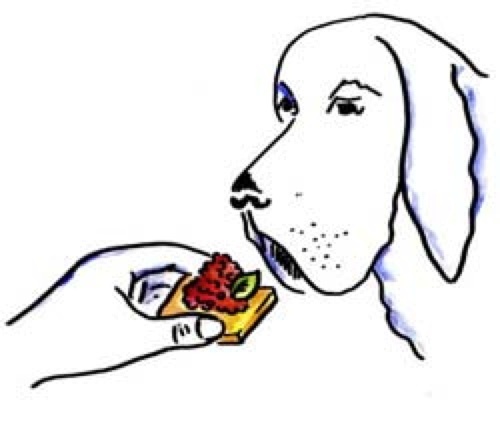 Although only one in six people correctly guessed that dish C contained the dog food, almost 75% rated it last in terms of taste. People significantly loathed the dog food (Newell and MacFarlane multiple comparison, p less than 0.1), and that did not correlate with relative sobriety. To cap it off, the average taste rankings of the five spreads exactly matched their relative prices. Perhaps this result is not surprising, given that numerous blind taste tests involving hundreds of people have shown no correlation between the price of wines costing from $1.50 to $150 and their reported taste. Left alone in a cage with a mountain of cocaine, a lab rat will gorge itself to death. Caught up in a housing bubble, bankers will keep selling mortgage-backed securities — and amassing bonuses — until credit markets seize, companies collapse, and millions of investors lose their jobs and homes....And news anchors and television personalities who have their own shows, Web sites, blogs and pages on Facebook.com and MySpace.com will send Twitter messages until the last follower falls into a coma. At the height of the subprime folly, there was not enough outside regulation or inner compunction to restrain heedless excess. It’s too late for traders, but that economic mess should be a lesson for those who traffic in information. Like bankers who never feel they’ve earned enough, television anchors and correspondents apparently never feel that they have communicated enough....It’s not just television, of course. Ordinary people, bloggers and even columnists and book authors, who all already have platforms for their views, feel compelled to share their split-second aperçus, no matter how mundane. Those who say Twitter is a harmless pastime, which skeptics are free to ignore, are ignoring the corrosive secondary effects. We already live in an era of me-first journalism, autobiographical blogs and first-person reportage. Even daytime cable news is clotted with Lou Dobbsian anchors who ooze self-regard and intemperate opinion...On-air meltdowns are the new scoops. The CNBC correspondent Rick Santelli, a former trader, delivered a rant last week on the floor of the Chicago Mercantile Exchange about the Obama administration’s mortgage bailout proposal. And that space has, as of 4:20 on Friday afternoon, 158 followers. Twitterers who maintain that their messages must have meaning since they have an audience should keep Mr. Santelli’s void in mind. There are always some people who, given the chance, will respond to anything, even nothing. How early abuse in humans changes the adult brain. Studies on rat models have shown that affectionate mothering alters gene expression to dampen physiological responses to stress, while early abuse has the opposite effect. Now these basic results have been extended to humans by McGowan et al., who carried out a study of people who have committed suicide. They found that that people who were abused or neglected as children showed genetic alterations that likely made them more biologically sensitive to stress. 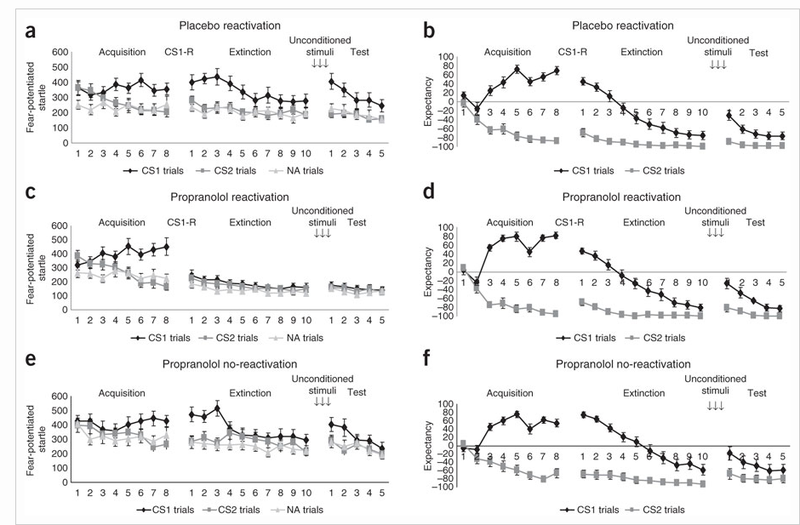 An epigenetic regulation of the glucocorticoid receptor gene, NR3C1, is observed in humans who had been abused as children that is consistent with predictions derived from a rodent model in which early postnatal experience influences adult responses to stress. (Decreases in the expression of this receptor increase reactivity to stress.) I pass on their abstract, and here is a nice explanation of what epigenetic changes are (see also the review by Benedict Carey). Maternal care influences hypothalamic-pituitary-adrenal (HPA) function in the rat through epigenetic programming of glucocorticoid receptor expression. In humans, childhood abuse alters HPA stress responses and increases the risk of suicide. We examined epigenetic differences in a neuron-specific glucocorticoid receptor (NR3C1) promoter between postmortem hippocampus obtained from suicide victims with a history of childhood abuse and those from either suicide victims with no childhood abuse or controls. We found decreased levels of glucocorticoid receptor mRNA, as well as mRNA transcripts bearing the glucocorticoid receptor 1F splice variant and increased cytosine methylation of an NR3C1 promoter. Patch-methylated NR3C1 promoter constructs that mimicked the methylation state in samples from abused suicide victims showed decreased NGFI-A transcription factor binding and NGFI-A–inducible gene transcription. These findings translate previous results from rat to humans and suggest a common effect of parental care on the epigenetic regulation of hippocampal glucocorticoid receptor expression. Biased minds make better inferences. Heuristics are efficient cognitive processes that ignore information. In contrast to the widely held view that less processing reduces accuracy, the study of heuristics shows that less information, computation, and time can in fact improve accuracy. We review the major progress made so far: (a) the discovery of less-is-more effects; (b) the study of the ecological rationality of heuristics, which examines in which environments a given strategy succeeds or fails, and why; (c) an advancement from vague labels to computational models of heuristics; (d) the development of a systematic theory of heuristics that identifies their building blocks and the evolved capacities they exploit, and views the cognitive system as relying on an "adaptive toolbox;" and (e) the development of an empirical methodology that accounts for individual differences, conducts competitive tests, and has provided evidence for people's adaptive use of heuristics. Homo heuristicus has a biased mind and ignores part of the available information, yet a biased mind can handle uncertainty more efficiently and robustly than an unbiased mind relying on more resource-intensive and general-purpose processing strategies.